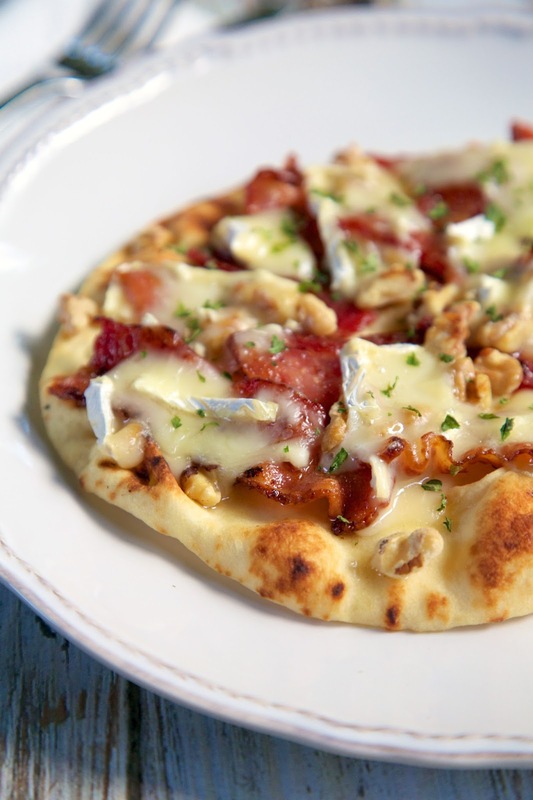 Honey Bacon Brie and Walnut flatbread - the flavor combination is out of this world! Inspired by my favorite sandwich in Amsterdam. Great party food! This dish was inspired by my first lunch in Amsterdam. We ate at a cute little sandwich shop. I got a chicken, cheese, bacon and tomato sandwich, and Amanda got a honey, bacon, brie and walnut sandwich. They were both good, but I absolutely LOVED Amanda's sandwich. I knew I had to recreate it at home. I had some Stonefire naan flatbreads in the freezer, so I decided to make a flatbread instead of a sandwich. O-M-G! We both LOVED this! The combination of sweet and savory really hit the spot. We ate this for dinner and again for lunch the next day. I couldn't get enough of it! It is so simple, yet so delicious! You must make this ASAP - trust me on this one! Cook bacon until crispy. Chop each slice into 3 or 4 pieces. Place 1/4 of bacon slices on top of each flatbread. Drizzle 1 Tbsp honey over each flatbread. 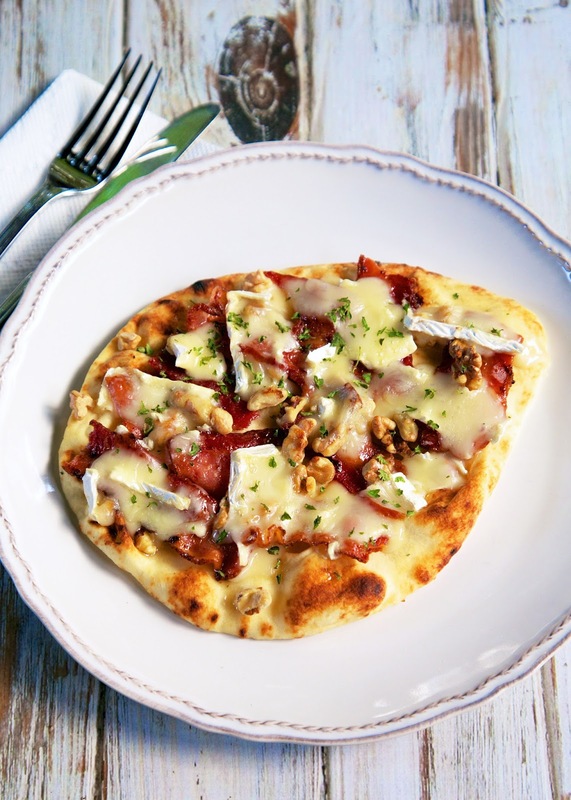 Top each flatbread with 1/4 brie cheese slices and 1 Tbsp chopped walnuts. Place flatbreads on baking sheet and broil until cheese is melted, 2 or 3 minutes. I love the Stonefire Naan! And this combination of toppings sounds amazing! Anyone tried something other than Brie?